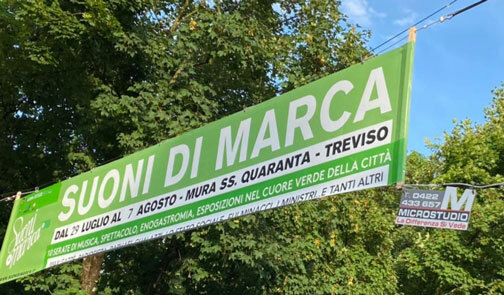 The banners are the most effective way to promote exhibitions, fairs, promotions, sales and any other event, we produce, print and run the installation since 1960, since then Microstudio is synonymous with road banners and advertising banners in Treviso and the province. These advertising banners are installed across the street and guarantee maximum visibility to the exposed advertising message. 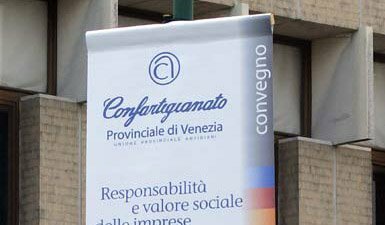 Our graphic studio will be able to realize banners and street cloths and for every use, always beautiful and visible, we take care of the installation in Treviso, Mestre, Belluno, Padua, Venice, Montebelluna, Oderzo, Castelfranco, Conegliano, Vittorio Veneto, Padua, Vicenza, Jesolo. 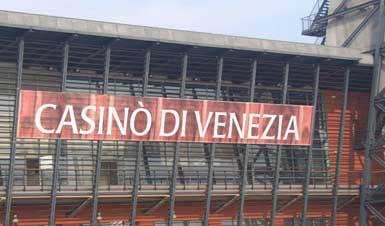 The banner, produced by us, is made of weather-resistant plastic fabric, generally PVC or mesh net, but we also make it in TNT and polyester fabric. Whether they are road banners (= advertising sheets suspended above the road) or simple eyelet banners, they have undergone improvements, tests and modifications that have made them one of the best products of this type on the market, the confirmation comes from the fact that our competitors have been copying us for years and try to match our perfection, which however does not stop at the only constructive way, but starts from the graphic design entrusted to our graphic studio in Treviso, continues with the production and installation and removal Finally, with Microstudio you can sleep peacefully, our banners are in fact protected by insurance. 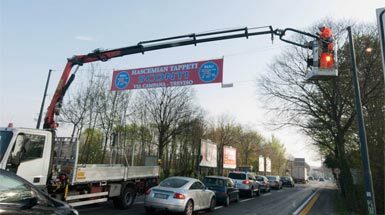 In almost 60 years of activity, we have created banners installations, of all sizes practically everywhere, even in extreme conditions with winds at + 100 Km / h, well they have always resisted. Making visible a commercial activity inevitably requires the use of advertising elements and forms such as signs, advertising drapes or panels and advertised supports. The advertising banner is an excellent way to advertise offers, fairs, events of all kinds. 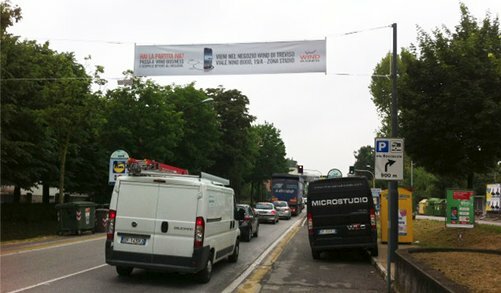 In this case, a store in Treviso relied on Microstudio to create an advertising road banner for the promotion of a promotion. Among the events that need to be publicized first of all are festivals, fairs, festivals and other types of local events. 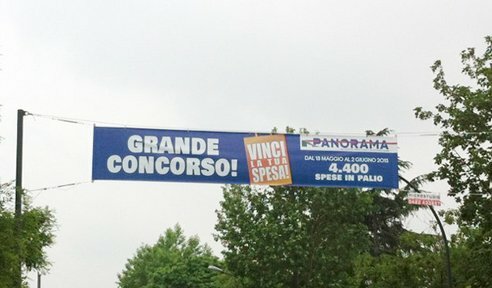 Thanks to modern digital printing techniques and our experience, it has been possible to realize this advertising road banner printed on reinforced pvc fabric. Construction site is always a great opportunity to apply an advertising cloth. The printed protective net, allows you to get excellent visibility to your products, makes the building site neat and tidy. 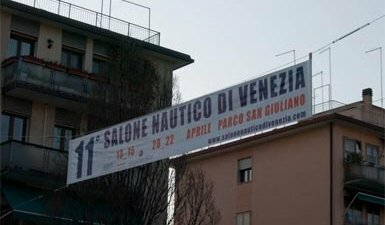 Since its first edition, Venice Boat Show has relied on the graphic studio of Microstudio for the creation and installation of various advertising media, including this large micro-perforated cloth banner. Print PVC road banners with reinforcements, installed with wooden ropes and stakes, dimensions 6 meters by 1 meter. 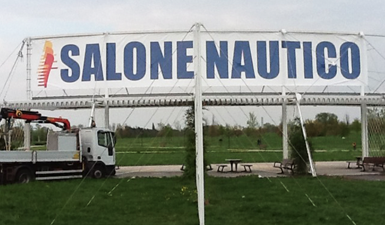 Digital double sided printing for outdoor, weatherproof. Print PVC sheet with reinforcements and studs size 3 mt for 1 mt. Digital printing for outdoor, weatherproof. 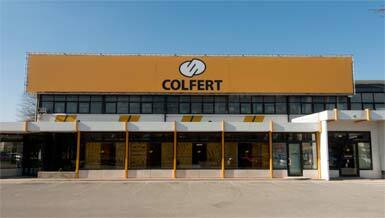 The historic Colfert company asked us to place the new illuminated signpost on the occasion of the new headquarters. Print PVC sheet with reinforcements and studs for installation on a structure made of innocent pipes and Kee-Klamp® joints. Digital printing for outdoor, weatherproof. Construction and installation of 6x1 mt road banner in 800 g PVC cloth. 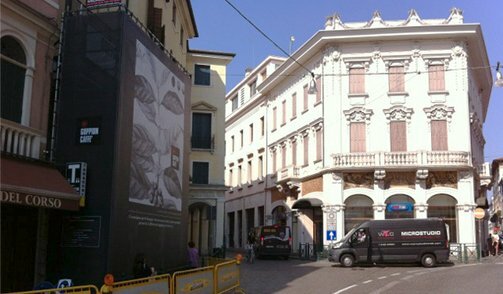 Installed in Mestre (Viale Vespucci) with wooden ropes and stakes. 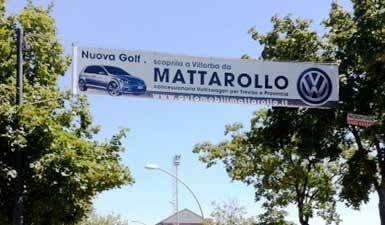 Advertising road banner measures 6x1 meters in PVC cloth of 800 grams. Installed in Treviso. 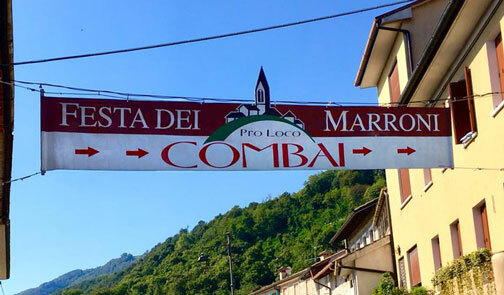 The detail of this advertising banner is the tip of the bell tower that bursts out from the overall size of the street banner. 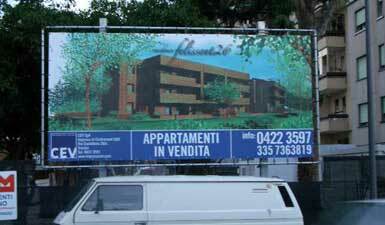 Graphic elaboration, printing, realization and installation of this finished 3x2 mt advertising cloth. The high quality print is made of fireproof PVC canvas with aluminum rods for wall mounting. Design, printing and realization of this advertising banner composed of four-color printing on pvc 850 gr. Installed in Venice S.Giuliano bridge towards Tronchetto. Advertising banner measures 6x1 meters in PVC cloth of 800 grams. 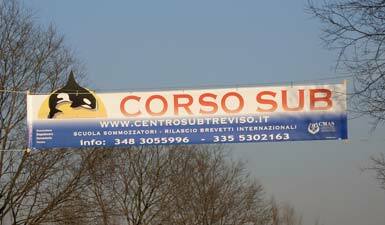 Installed in Treviso with wooden ropes and stakes on urban and extra-urban roads, with great visual impact. The particular of this advertising banner is the logo (the orca) that overflows from the overall dimension of the road banner. 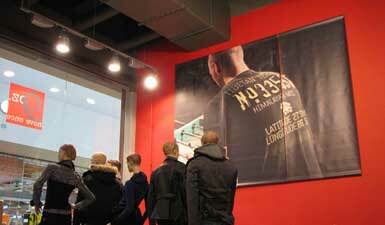 Printing and installation of advertising cloth in dimensions 10 x 2 meters, with the aid of a mechanical self-test. The support is on the net, to avoid the excessive effort that would give the wind creating the sail effect. Graphic study, construction and installation of 6x1 mt road banner in 800 g PVC cloth. 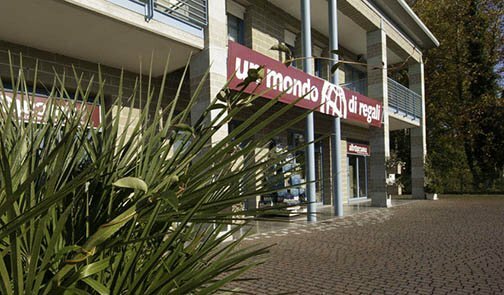 Installed in Treviso (Viale della Repubblica) with wooden ropes and poles, with the aid of self-basket to ensure the safety of the installer.